Every time AncestryDNA changes something, the naysayers come out in force. If it changes the way it reports something. If it changes its ethnicity results. If it changes its terms of service. And, now, that it’s changed a privacy setting. But sometimes AncestryDNA gets it right. And immediately the naysayers appeared. “Quit worrying so much about privacy absolutely ridiculous,” one said. Another chimed in: “this is a terrible change and the power of Ancestry’s DNA testing is greatly diminished.” Yet another started asking about refunds. But the simple fact is: this is exactly the kind of change that’s the right thing to do. First off, the default setting is still to be included in matching. People who’ve already tested will still see their match lists; new testers will be encouraged to choose the option to see matches as well. This is no different from the choices offered at other testing companies such as Family Tree DNA and at least as much in terms of choice as those at 23andMe. Second, the option allows people who might otherwise not test at all a privacy option that might encourage them to stick their toes in the DNA testing waters and, once they see that it’s safe in there and there are no sharks in those waters, to open up to more sharing down the road. Third, and perhaps most importantly, we all have to understand and accept that we don’t have a right to access other people’s DNA results just because they happened to test at the same company. Many people take DNA tests for reasons other than connecting with family, and the fact that we’d like to see (and benefit from) their test results doesn’t override their interests and their concerns in their own data. Now look… I’m a genealogist. More, I’m a genealogist with a ton of brick walls in my own family research. I’d like everybody on the face of the earth to DNA test and to make their results widely accessible. I’m as frustrated as anybody else when I want to see test results and can’t, or even want to see an online tree and can’t. But I don’t have a right to demand access to everyone else’s DNA results just because I’d like to see them, just because they might help me in my own research quest. People test for different reasons. Sometimes those reasons march hand-in-hand with our research interests. And sometimes they’re at cross-purposes with our wants and desires. But the one thing that we all have to accept is: it’s not our DNA. It belongs to the tested person, and that tested person has privacy rights that outweigh any interest we might have. Either we join in protecting those privacy rights — or we’d better expect the government to step in and do it in a way we don’t like one bit. This is one time AncestryDNA got it right. And — reluctantly or not — we all have to accept that the only person who has a right to make the decision when it come to control of DNA results is the person who tested. This will work as an opt-in, Louis — you have to tick the box. But Ancestry has stated it will try to explain the benefits of matching. I have been a perpetually infuriated member of Ancestry for years. I have always found it interesting that they will let you know if you are DNA connected to a person whose family tree you visit, yet uses the message (paraphrasing here): “This person is not on your DNA Match List or has not yet been tested”. Which leaves you in limbo. Why not just say “This person is not on your DNA match list” OR “This person has not yet been tested”. Why does Ancestry find it alright to announce matches without their members’ consent, yet feels that telling you a person does not match you violates their privacy? I asked Ancestry this question a while back and got this “privacy” response. there isn’t a match there’s no way you could know whether or not the other person has tested unless you asked them. Now, it’s feasible that in the future Ancestry will ask you for permission to tell other users whether or not you have tested, but until then it’s right that they respect your privacy. The new default is now to opt in to matching. I have two screenshots of the process on my blog: https://cruwys.blogspot.co.uk/2017/11/ancestrydna-updates-six-million.html I think AncestryDNA have made a very wise choice. It’s very important that people understand the implications of participating in a matching database and the only way this can be done is by asking for explicit informed consent. When I posted a positive comment on the Ancestry blog yesterday it seemed like it was the only one – so I’m glad that two of the stars of genetic genealogy (Judy & Debbie) have come to the same conclusion. But I do have one concern: Ancestry indicate that you can turn matching on and off at any time – won’t this make it possible for someone to switch on matching, download all their matches, then switch it off again? I don’t think it would be so quick that matches who have notifications turned on wouldn’t get notice and be able to see it. But that is possible, of course. Peter, I’m glad you agree as well! If you turn off the matches then the system responds instantly. Likewise if you switch them back on again. It is therefore quite possible for people to download their matches and then switch off the matching. If we agree to participate in matching we can’t then decide which of our matches has access to our results. It’s all or nothing. In reality, the people who are most likely to want to switch off matching are those who have no interest in genealogy and are fed up with being pestered by annoying genealogists and those who have discovered a surprise relative in the database and are still trying to come to terms with their discovery. I would have to agree in this case it’s a good thing. If if was just a one way thing than we might have the right to be upset, but by opting out they cannot view matches either. They can’t remain private while gleaning information from others. By opting out they also don’t show up as a useless match to us. From the screen shots at Debbie’s blog I saw that Ancestry gives you the choice of seeing matches or not. That is something. But why would I choose not to see my own matches? Checking with a room full of DNA genealogists showed that the concern was about unknown close relatives. Some found the issues around this too confronting. But they would not shut out all matches to avoid doing so, or they would have wasted their effort – they have not tested just to have a chat over coffee about ethnicity! So, for most of them, this is a choice that is not a choice. Good idea, but missed the mark. Christopher: Case in point. I have a very close match with a professional genealogist (282 centimorgans) who really doesn’t want to discuss details with me. He submitted his DNA in such a way as to mislead people and I inadvertently discovered it and he seemed to be a bit miffed. I have encountered people who get upset with unflattering details of the past, but never expected a professional genealogist to act that way. I think this is part of the point Judy is trying to make. Some people have indeed “tested just to have a chat over coffee about ethnicity”. And it’s their privacy that Ancestry is trying to protect. While you and I as genealogists may find this annoying, or think that those people’s efforts are somehow “misguided”, that’s their choice, and needs to be respected. I, personally, have thought that all the Ancestry commercials are a little misleading when they crow about the ethnicity results, especially when those results can sometimes be considered murky at best, and even a moving target. Yes, those results getting better the more people who test, but they’re not 100% and probably never will be. Some people don’t understand what Ancestry.com was designed to be used for, and Ancestry seems to be blurring some lines in that respect. Christopher: I would bet there are more users who tested “just to have a chat over coffee about ethnicity” than you realize, for one simple reason. All of Ancestry’s DNA advertising focuses on just that – ethnicity – and not on finding lost relatives. We’ve all seen the TV commercials. “I thought I was Scottish but found out I was German.” or “I found out I have Native American ancestry!” (That last one fuels probably about 50% of Ancestry’s sales, I would guess.) It’s a powerful curiosity and Ancestry takes full advantage of that fact. As long as people who opt not to be ‘seen’ are also denied permanently denied access to other people’s results by default as well. As a scientist (geneticist), I’m not precious about my DNA…. it’s a very useful tool…… but I most certainly don’t want someone who ‘hides’ behind a cloak of privacy to be able to make use of any of my information, including shared matches. There’s certainly a disconnect between the science people and the marketing side. While I agree that “privacy” is a top priority I also believe when you partake in DNA testing you are giving up some of that privacy. How many of these folks who wish to OPT OUT of sharing their DNA (which by the way is really just numbers (CM/DNA) will be on Gedmatch? What is their privacy. 80% of the folks who match my DNA to a degree have PRIVATE TREES – ZERO INFORMATION other than their CM/DNA number. Whoopee! Of the 20% on my list with a few names 10% are useless because I’m not about to trace my family history back to some Queen, King, Lord or as one has done God, Adam & Eve (and I’m not joking here). I do believe the further you go into “privacy” you open another door that will actually be the end of DNA matching on Ancestry. For the last 3 months I have hardly had any new matches of even the distant cousin kind so things are slowing down. I have been researching my family for 20 plus years and my name is all over the internet so why would I be needing privacy for a few Cm/DNA numbers? Just my opinion but sometimes when the ball starts rolling down hill you can’t stop it!! That’s my own view as well, but the fact that you and I think that doesn’t mean everyone does. These sorts of individual privacy controls are the “different strokes for different folks” that we all may need at some time or another. I have read that if a person wants their dna results private then they will not be able to see other results. Good. Ancestry has not yet provided us with the tools needed to analyze matches. For a long time Ancestry ads have been about “find your ethnicity”. 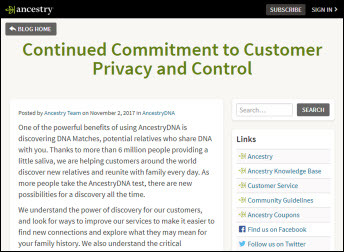 Now that they have built a data base of 6 million tests – ancestry continue to make money on their large data base. What a convenient time to start caring about DNA privacy. Can I opt out of them ever making money off selling my DNA? Judy’s readers are making some very valid points unlike the raft of, comments on the Ancestry blogpost to the effect that “well if they won’t give me ALL my matches, regardless of the other person’s wishes, then I’m just gonna pull my results off line and/or tell everyone not to bother taking an Ancestry DNA test because ‘it isn’t worth the money’ unless they can see every single one of the other testers who match them, without a single exception.” In effect, in a fit of pique because Ancestry is no longer going to force everyone to allow their DNA to be seen by who knows how many potentially matching strangers, they are going to just toss all those good matches with people like you all, who are anxiously waiting to make contact right out the window. That kind of thinking makes absolutely no sense at all to me.